Wouldn’t it be nice if all your apps and social networks talked to each other? Enter something in one app, it’s entered somewhere else. Post something on LinkedIn and send it out to Facebook. Many cloud apps already have built in integration with other cloud apps. Sending something to DropBox seems to be an option in every app. But there’s always something missing. So if you’re using a lot of cloud apps and want them to work together, you have to look at task automation services like IFTTT (If This Then That) and Zapier. Even if you’re chained to desktop apps, in some cases you can get some help keeping those aligned with your cloud apps with these services, too. Which one to choose? It depends on what you want to do. Both work with hundreds of apps so your first step would be to review those to see if they partner with the apps you want to use (lists for each here – Zapier, IFTTT). But one big difference is that IFTTT has iPhone and Android plus lots of “smart home” integrations. 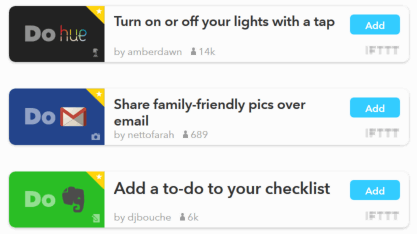 IFTTT also has a mobile app and new “DO” apps that perform simple tasks like emailing yourself reminders, quickly sharing photos or turning off the lights in your living room. Zapier doesn’t support mobile operating systems or have any mobile apps but it does support many more business related apps than IFTTT. Plus, Zapier offers enterprise level subscriptions so it can be used with Exchange, Amazon Cloud – even SQL Server. 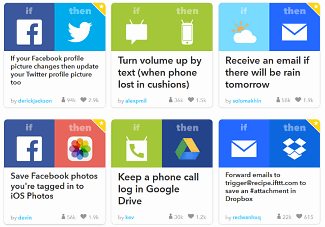 Another difference is that IFTTT is totally free. Zapier offers a limited free service with paid plans starting at $20 per month that give you more Zaps, tasks and faster actions (5 minute “delay” versus 15 minutes). If you’re looking to get the most out of your business productivity apps, the Zapier paid plans make sense. For both, the process goes something like this: Pick a “trigger” app, define a task you perform in that app and finally, pick an “action” app where you want a “reaction” to your trigger to occur. What you’re doing is creating a conditional formula: If this happens, then that should happen. An easy way to find a formula is to specify the two apps you want to work together. For example, on Zapier, I’ll pick Twitter and DropBox from their “Zaps” collection (pre-made formulas) because I want to save a copy of all my Tweets in a file in DropBox. 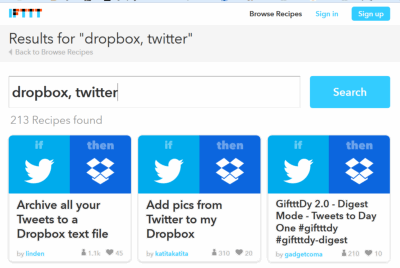 On IFTTT (shown below), the process is similar except I’ll put the two apps in the “Recipe” search box. Then I’ll scroll to find a Zap/Recipe that matches what I want to do. Or you can create a Recipe or Zap starting with your trigger app then selecting from the available actions. Use the links for create/make new Zap or Recipe. What if there’s no formula (or you can’t find one)? Search online for what you want to do and see what comes up. Someone somewhere is likely to have already created a formula for the same thing. The sheer number of apps and formulas can be overwhelming so start with apps you currently use. Think about redundant actions you perform like signing into multiple social accounts to post or copying contacts from one place to another. What is it that you’re always wishing you could do that your app doesn’t have? Maybe things like text alerts, email notifications, automatic copy/paste from one app to another. Don’t forget to check if an app already has the functionality you’re looking for. Most social networks have several options for email alerts for example. And I was going to mention Google’s appointment reminders via text but they’re discontinuing those at the end of June 2015. If you relied on that, maybe it’s time to look at one of these automation services. No WordPress blog with plugins? Don’t use a social management tool like Hootsuite? No problem. There are plenty of formulas that will cross post for you. Choose a “base” network, let’s say Facebook, and set up triggers to also post to Twitter, LinkedIn and so on. You can also set up automatic retweets (I’ve noticed some people do this for my posts – thank you very much!) or replies and auto posting from curation apps (e.g., if I put an article on Pocket, post it on LinkedIn). If you’re using email marketing services like MailChimp, form tools like Wufoo or run webinars or events, create a trigger to send new emails to a spreadsheet, a list/note/storage app or a supported CRM. It can work the other way, too. Add a contact to your CRM and send it to your email marketing service to keep your list up to date or to a spreadsheet to use for other purposes. Send emails from any email app to your Zapier or IFTTT email address then let their parser extract contact information. Ideally, you want it to go into your CRM but if you’re not using one of the supported CRMs, you can send it to a DropBox file, Evernote etc… to retrieve later to add to your CRM. You can send yourself email or text alerts (the number per day is limited for SMS) for just about anything. Some useful formulas to try are those that send emails as text messages or alert you via text when an email from a specific sender’s email arrives. You can get email or text alerts for appointments, task list items or when new activities are posted to a project you’re collaborating on. You can keep on top of news, too. Set up a daily email digest from your Feedly account or an email or text alert for Tweets about a company or from a specific user. There are also several formulas for sending voicemail messages (from Google Voice or IFTTT/Zapier phone numbers) to email and SMS. Tip: If you’re using POP email or your mail app is not supported for some of the formulas you want to try, have your business emails retrieved at specially created Gmail account. (If you have a Gmail account already you could use it but your formula would be more complicated if you just want to use this for business emails.) Just make sure that the option to LEAVE mail on the mail server is checked. Then you can use this Google account for various email tasks and continue to use your regular email app (Outlook users, I’m talking to you!). Unfortunately, you won’t find many formulas for most CRE cloud apps (ahem…developers…get on that, huh? ), desktop standbys like Act! or Outlook or most any CRE data service. But Gmail and Salesforce users can have a field day with these formulas especially for CRM and marketing integrations. Love apps that connect apps. Right now I use zapier to move relevant items automatically from my email to our Trello.com board (where we keep track of all our business initiatives) and slack.com. We are starting to use Slack.com for internal communications as that will integrate with also some of our IT ticket support information (via Groovehq.com) as well as project management tools like Asana/Dropbox. As I get 200+ emails a day (and that’s not counting the unsolicited ones and social networks that Gmail helpfully sorts out into the social and promotions tabs), I’m desperately in need of solutions to ensure I don’t miss the important ones. Tools that get apps to talk to each other are pretty vital. And to think … I 20 years ago I was trying to convince the CRE industry that “email wasn’t a fad” and here I am trying to eliminate (or at least minimize) my use of email. I wish developers of CRE apps would read your comment. So many agents are using these general purpose apps. You would think that they’d consider integrations more instead of creating standalone/one purpose apps. Have heard that SnapProp might be one that addresses this. Can’t wait to see it. Thanks for the heads up. I’ll check that out. I also wish that CRE apps would be across all devices. That’s one of the basic things we check for before employing them. Hey Chris. Thanks for the SnapProp mention. I have been in CRE for over 10 years and started building SnapProp out of pure frustration with how much time and money I was wasting on antiquated technology, fragmented services, and unreliable data. I used to use Metropolis when I worked for Daum, so initially I was searching for an upgraded version of that, but I couldn’t find anything so I decided to build what I wanted. A consolidated, integrated, cloud-based solution. So far we’ve seamlessly integrated with MailChimp and CRM and have built automated social media integration as well. In total we’ve been able to consolidate, integrate, and upgrade more than 30 tools & services for CRE. We’re pretty excited. I sincerely appreciate all your posts and everyone’s comments. We are listening to what people really want and are prioritizing tools & services. We want suggestions and feedback. We’ll be having a private on-line demo in a couple of weeks. You can sign up at wwwlSnapProp.com And as cliche as it may sound, it really is our goal to help Broker’s be more efficient. Does SnapProp require Gmail? Was looking around and thought I saw that. I have been using IFTTT since its inception and have also starting using Zapier this year and absolutely love it. We give our members RSS Feeds for ALL of their content and I wish more would embrace the use and power of these tools using our RSS Feeds. I know so many people do not get RSS Feeds, but they pack so much power when coupled with these automation tools. For instance, each time a broker posted anything at all on tBL AN, if they used our RSS Feeds they could do so much. You have now inspired me to craft a blog about these tools because I would be lost without them. The amazing part is depending on how use them, they have fremium aspects for those just starting out. If I were a CRE Marketing Director today, I would absolutely love these tools as so much busy work disappears when using Zapier or IFTTT. I think Zapier is much easier to use, I cannot put my finger on it, but although I have both, I find Zapier easier to integrate. Thanks Chris as always for inspiring me to push this stuff. Have to agree about Zapier being easier to use but IFTTT isn’t bad if you’re using the built in recipes. Haven’t tried the Do apps yet, but I will be getting the Do Notes (always sending myself notes!). Does the Broker List have any Zapier/IFTTT integrations (besides your very useful RSS feeds) – or is that something you can add (since you have an API). I thought I read that Zapier partners don’t pay anything. Think they do for IFTTT (likely the only way they make money since the service is free). I must say that threads like this make me miss Gary so very much. I miss him dearly and he would have been all over this and promoting it and showing brokers how to use it too. Such a tragic loss and I still cannot believe he is gone. Just wanted to mention him here as a tribute to him and all he did to encourage technology to the industry. What a guy! Love me some IFTTT – use it all day starting with my morning wake up weather text! I’ve been working with IFTTT for a while to automate a lot of redundant tasks. One of my big challenges that I have been trying to figure out is how to have multiple pdf attachments in one email/gmail get uploaded into a specific folder in dropbox. I have successfully done this when there is only one pdf attachment, however when you have multiple attachments on one email they do not all get uploaded. Working on the client/tenant side I request ALOT of info from listing agents so having a way to have multiple pdf attachments in one email get uploaded into a specific dropbox folder is my goal.